Yes, you read that title right, permanent markers. Think about it - all of those other art supplies you use make a colossal mess, so why not use permanent markers too? Sure, they might get on your tables, or on the children's hands, but if you take the same precautions that you would for paint - covering the table or using a tray, making sure the children wear smocks, etc. - then you can minimize the mess. Plus, it's a great opportunity to talk to the children about using the markers appropriately, and expressing your expectations clearly. If you want to be prepared with a few clean up tricks up your sleeve, check out this article on how to remove permanent marker from everything! 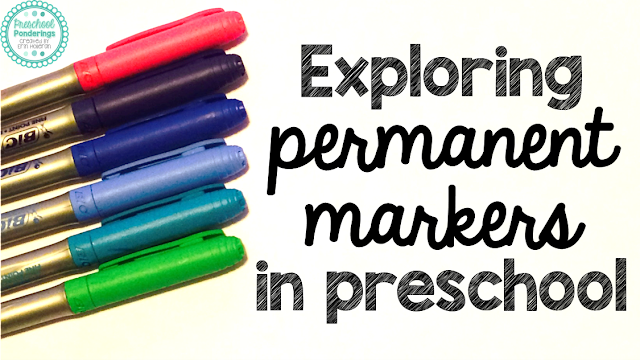 Permanent markers are fascinating because they react differently on different materials. There are a few different ideas for exploring these markers that will help the children learn about scientific principles such as creating a hypothesis, testing a theory, and observation. Collect different types of paper and fabric and see how the markers bleed on each type. Draw on materials with washable markers and permanent markers and see how each kind of marker reacts on the materials. I also suggest keeping your drawing time short or make sure your room is well ventilated, permanent marker fumes can be powerful!